Turmeric, Alum and 1/10 of 1% Benzoate of Soda added as a Preservative. Please make this available at Giant Eagle. From Anonymous of Lorain, Ohio on 2/7/2019 . This is my family's favorite relish. It goes great in everything. We used to find it at a local Farmers Market, but they said their supplier doesn't carry it anymore. Everyone that tries it loves it, glad I can at least buy it Online. Shipping is pricey though. From Amy Mains of O'fallon, Missouri on 10/10/2018 . Our family's favorite dill relish. From Anonymous of Chicago, Illinois on 9/14/2018 . Outstanding product in the adill category. Has been our favorite for more than 30 years. What is available on the shelves of our stores we shop at is poor by comparison. From Carol Secord of White Lake, Michigan on 1/22/2018 . 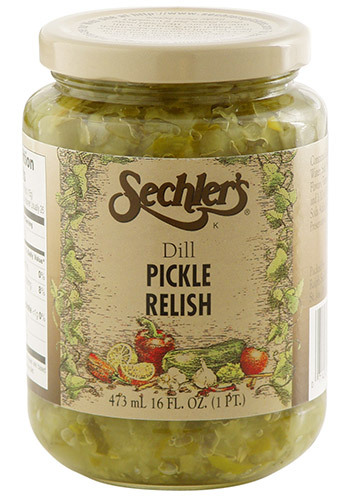 We love this pickle relish, the store where we used to purchase it closed. Until we find a store that sells it relatively close to us we will continue to order it online. Great packaging as well. From Rob of Columbus, Ohio on 1/16/2017 . This is quite simply my favorite dill relish anywhere. Couldn't find it locally any more so ordered online direct. Arrived in perfect condition promptly. Thanks!